Tags: Light Brown, Sea Green, Semi Formal, Shirt, Straight Trouser. Top: Light brown raw silk high neck long shirt heavily embellished neckline and sleeves. Stand collar with V-front. 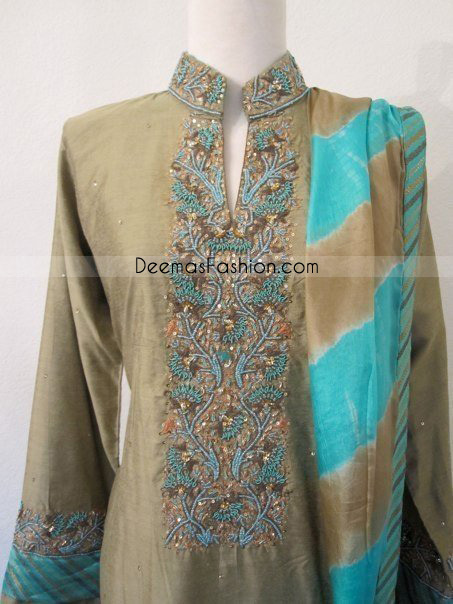 The shirt has applique work of banarsi sea-green chiffon on hem and sleeves. Embellishment work included tilla thread, beads and sequin work. Concealed back zip closure. Fully lined. Finished with piping on edges. Dupatta/Veil: Two colours plain chiffon dupatta having applique work of banarsi sea-green chiffon on edges.